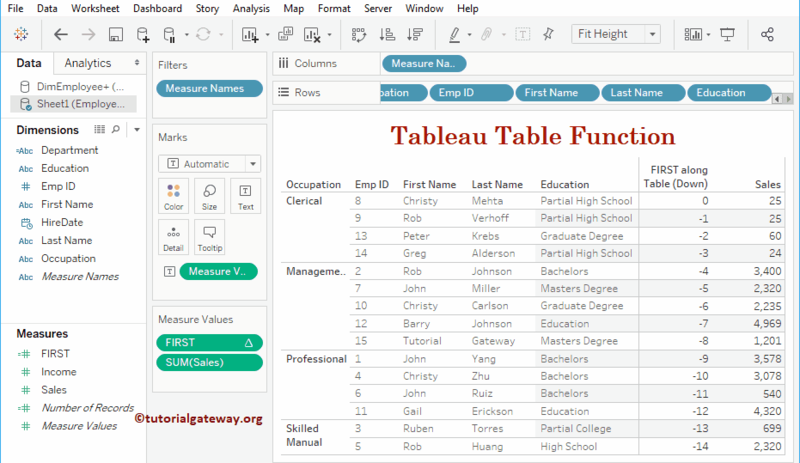 Tableau provides various Table Functions to perform the calculation on entire visual data. They are FIRST, LAST, INDEX, RUNNING_SUM, RUNNING_AVG, WINDOW_SUM, WINDOW_VAR etc. 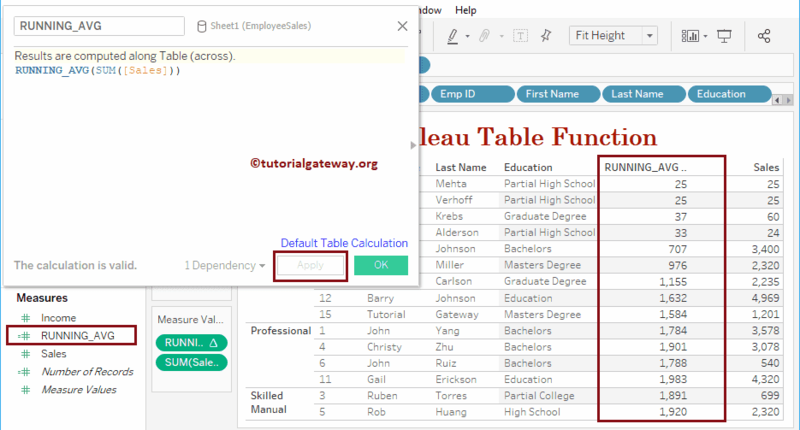 In this article, we will show you, How to use Tableau Table Functions with examples. To demonstrate these Tableau Table Functions we are going to use the below-shown data. As you can see, there are 15 records in this table. Remember, this is an Excel Worksheet. 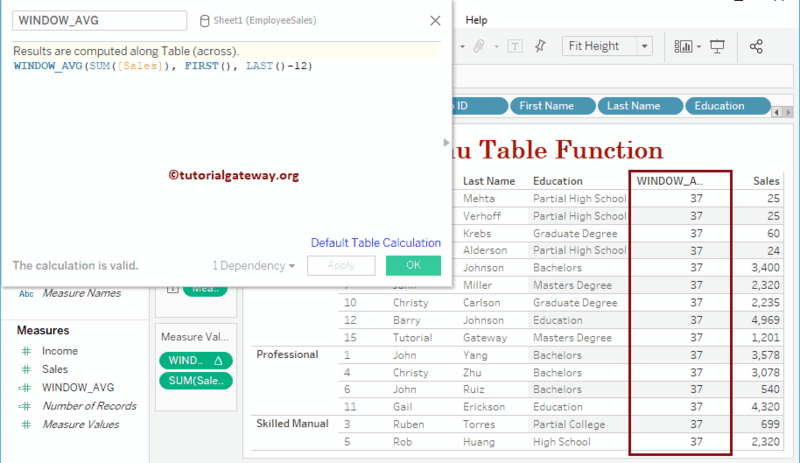 So, Please refer Connecting to Excel Files article to understand the connection settings. To demonstrate these table functions, we have to use table calculation. 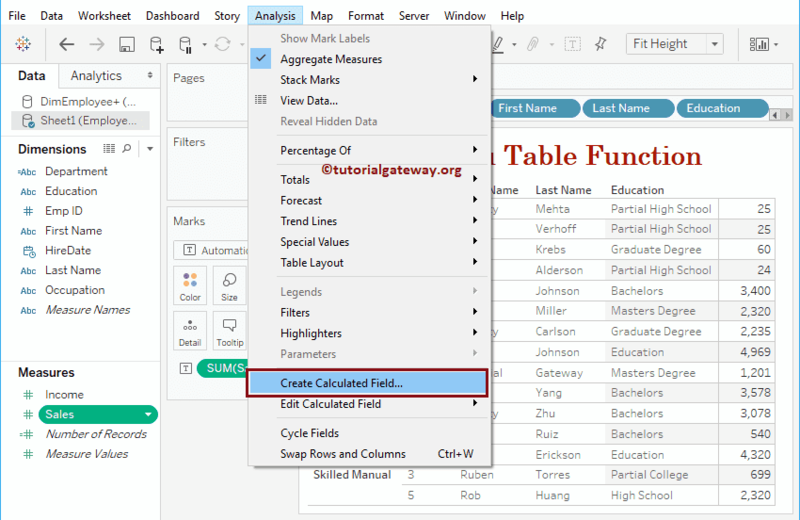 In order to create a table calculation, please navigate to Analysis Tab and select Create Calculated Field… option as shown below. 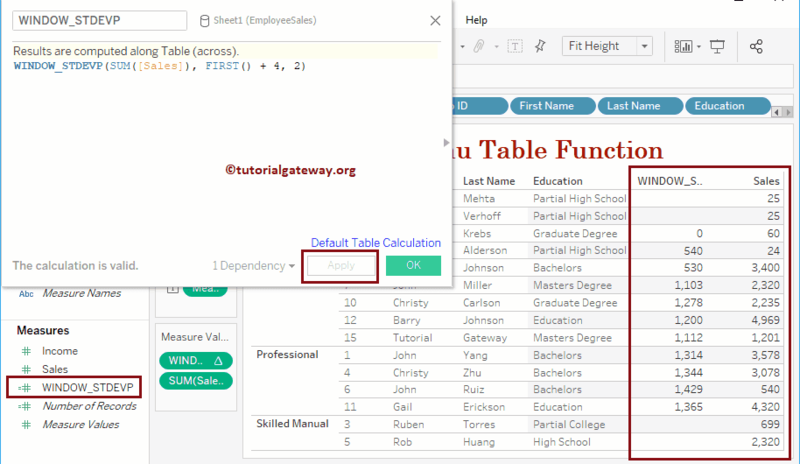 Once you click on the Create Calculated Field… option, following window will be opened. Here, we renamed the default calculation name as FIRST. 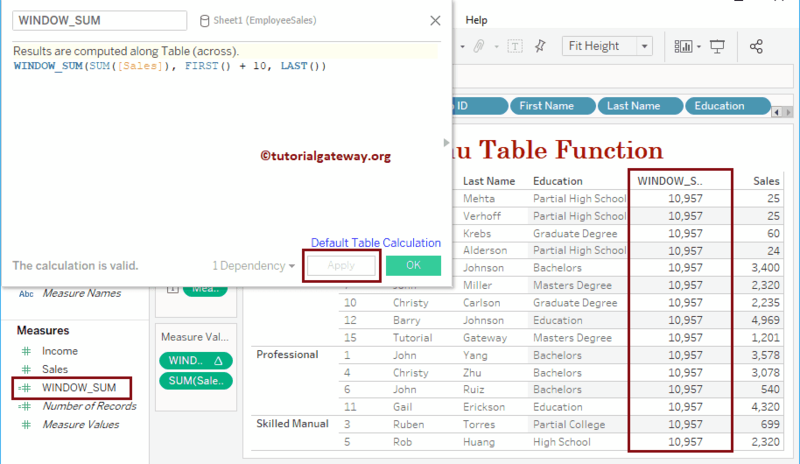 Or you can click Default Table calculation hyperlink to alter the default settings. Clicking that link will open following window. You can edit this table calculation by clicking the down arrow. 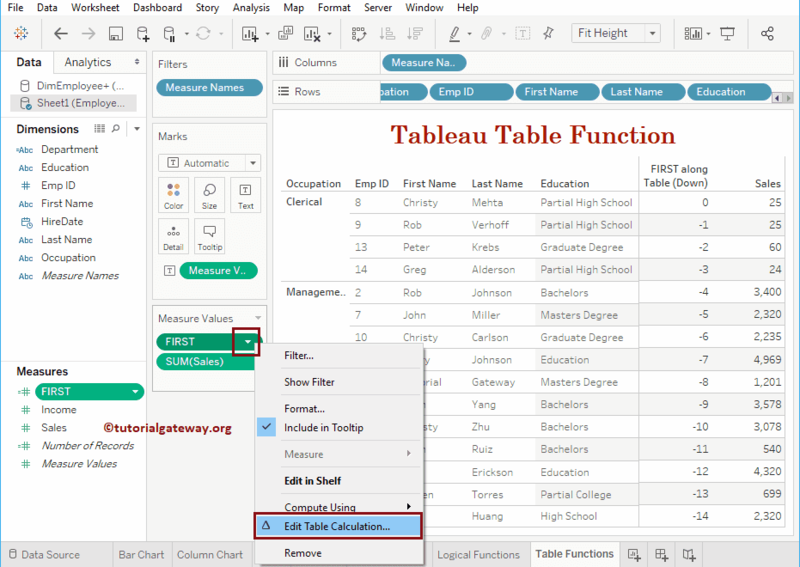 Next, select Edit Table Calculation option from the context menu. 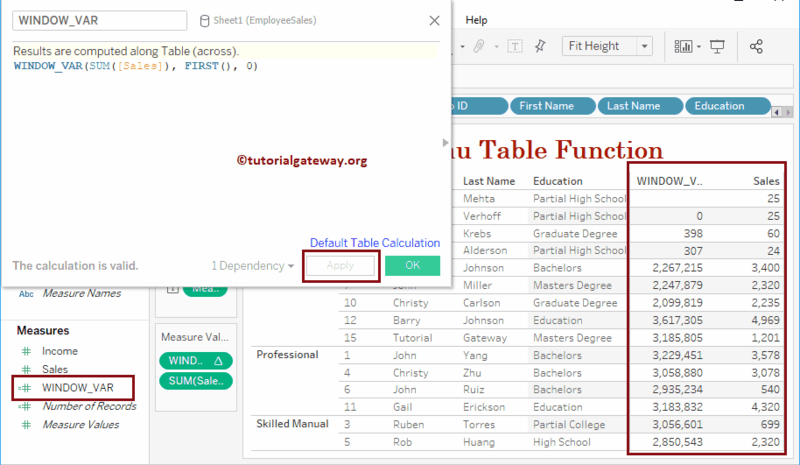 This will open a new window called Table calculation. 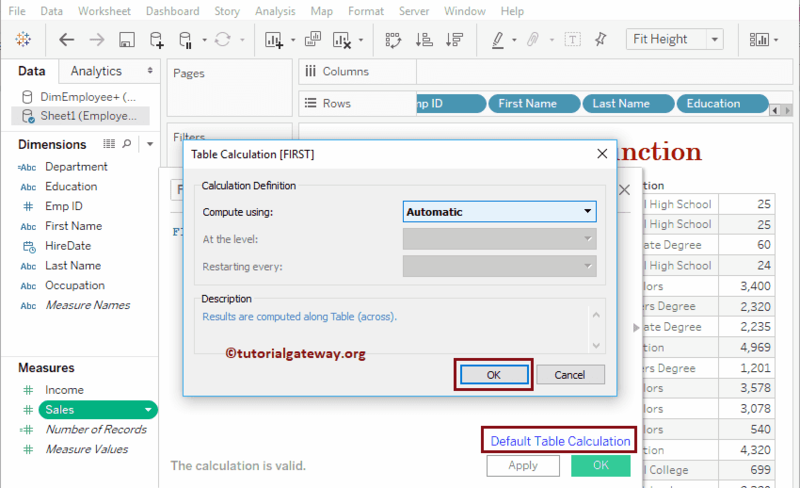 Use this window to change the calculation process. We already explained these properties in our previous article. So, please refer Table Calculations article to understand these functionalities. 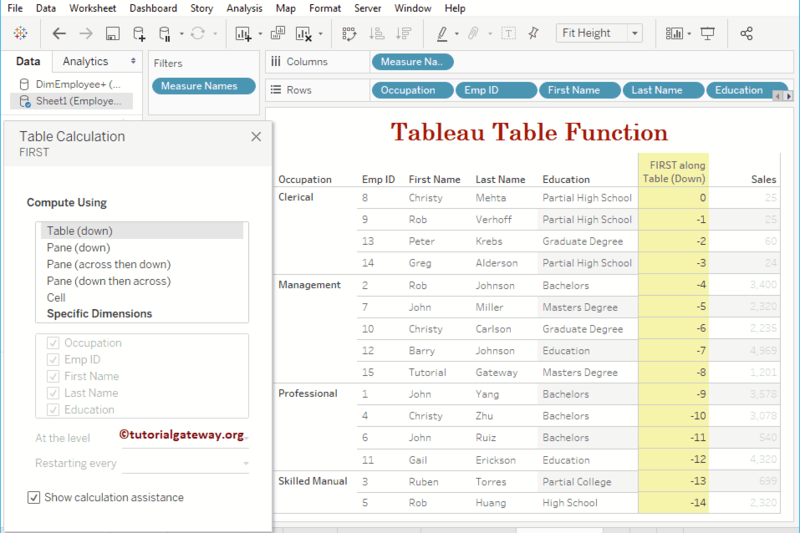 Below statement will calculate the running average of Sales column across the table. Let me add this RUNNING_AVG field to Measures shelf. Below statement will return the running count of Sales column. 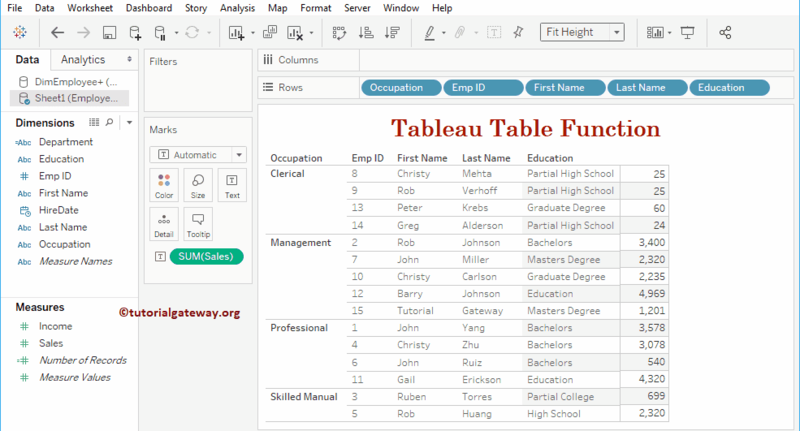 Let me add this RUNNING_COUNT field to Measures shelf. Below statement will return the running maximum value in a Sales column. Let me add this RUNNING_MAX field to Measures shelf. Below statement will return the running minimum value in a Sales column. Let me add this RUNNING_MIN field to Measures shelf. Let me add this RUNNING_SUM field to Measures shelf. Let me add this TOTAL field to Measures shelf. This time we are computing using Occupation. 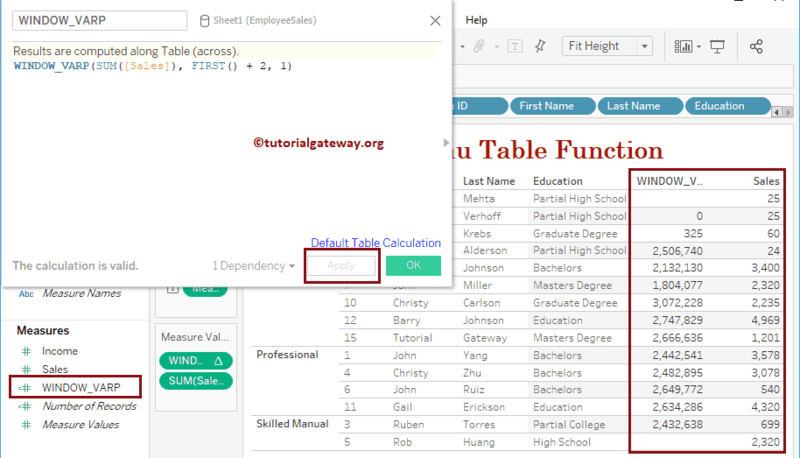 It means the total function will sum based on occupation. Below statement will calculate the average of Total Sales. Let me add this WINDOW_AVG field to Measures shelf. Here, the Sum of 15 records is 28, 794. Below statement will calculate the median of Total Sales. Let me add this WINDOW_MEDIAN field to Measures shelf. 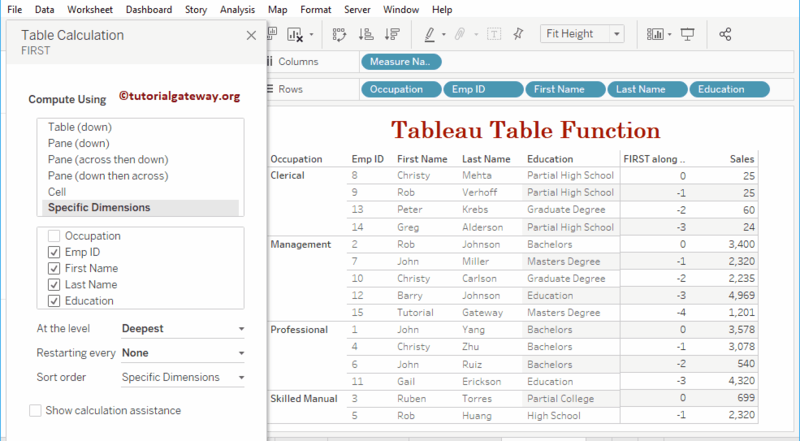 Let me add this WINDOW_MAX field to Measures shelf. Let me add this WINDOW_MIN field to Measures shelf. Below statement will calculate the Total Sales from 11 to 15. 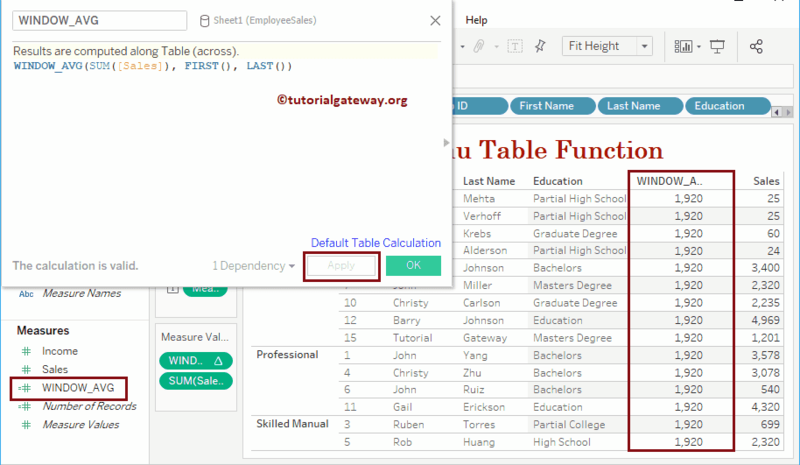 Let me add this WINDOW_SUM field to Measures shelf. Sum from 11 to 15 = 3078 + 540 + 4320 + 699 + 2320 = 10957. 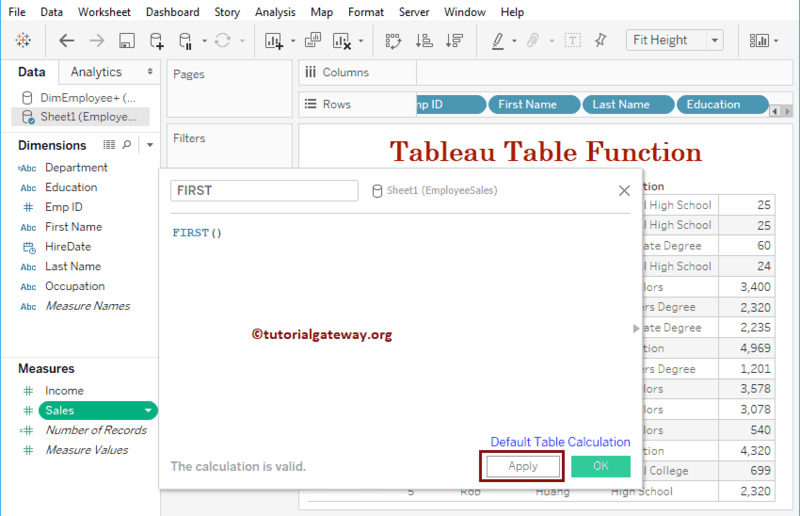 Below statement will calculate the variance from current row to the previous row. Let me add this WINDOW_VAR field to Measures shelf. 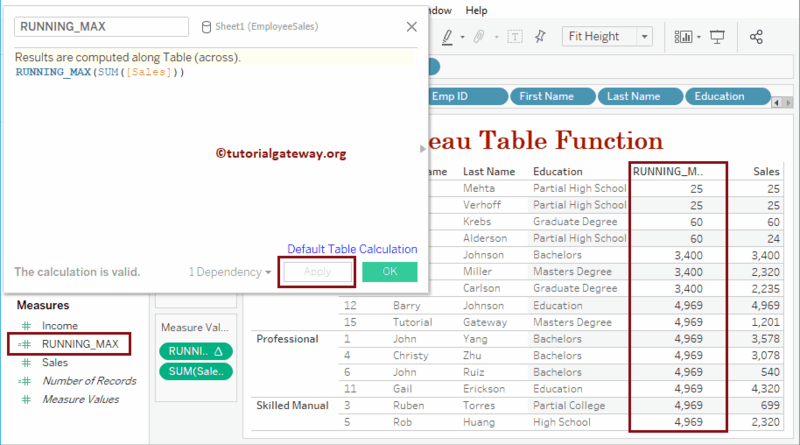 Below statement will calculate the variance from the third row to the previous row. Let me add this WINDOW_VARP field to Measures shelf. 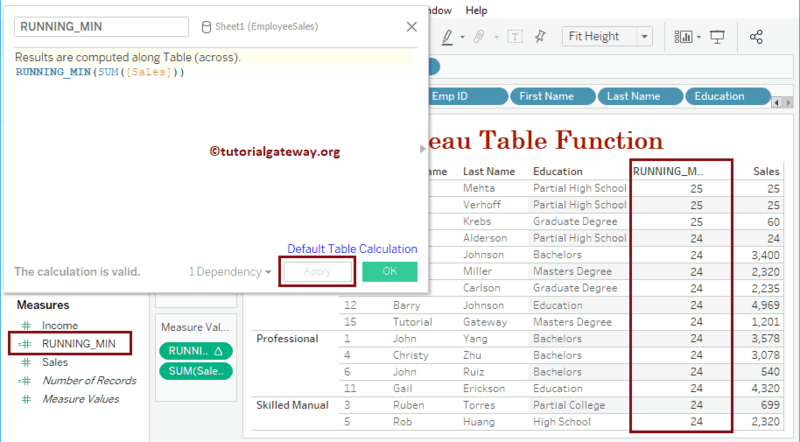 Below statement will calculate the standard deviation from the second row to the current row. 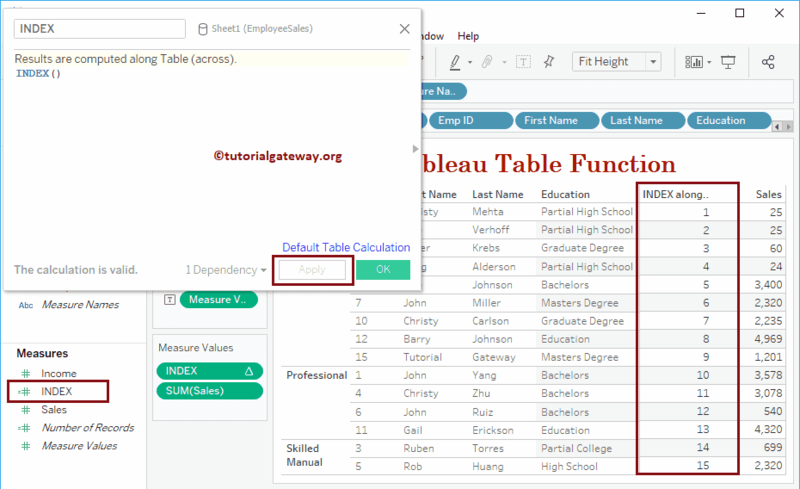 Let me add this WINDOW_STDEV field to Measures shelf. Below statement will calculate the standard deviation. Let me add this WINDOW_STDEVP field to Measures shelf. 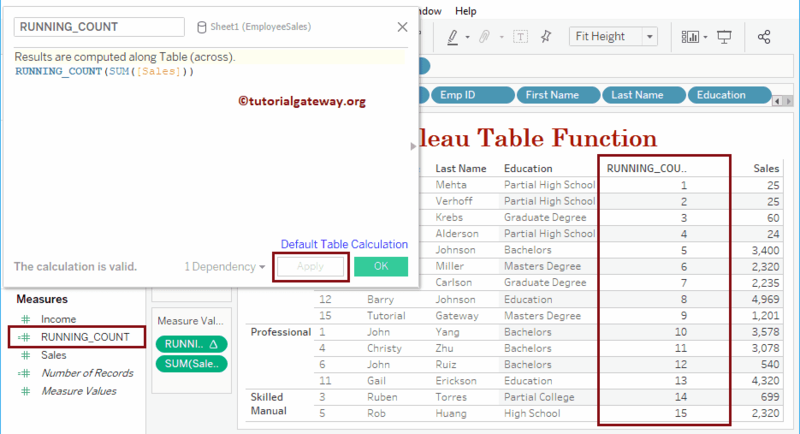 Below statement will calculate the 25% percentile from previous two rows to the current row. Let me add this WINDOW_PERCENTILE field to Measures shelf. 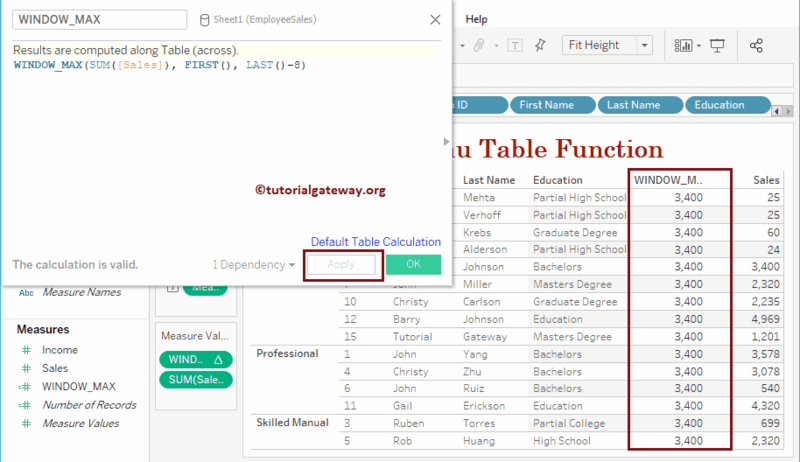 Below statement will find the correlation between total cost and sales amount from the previous three rows to the current row. Let me add this WINDOW_CORR field to Measures shelf. 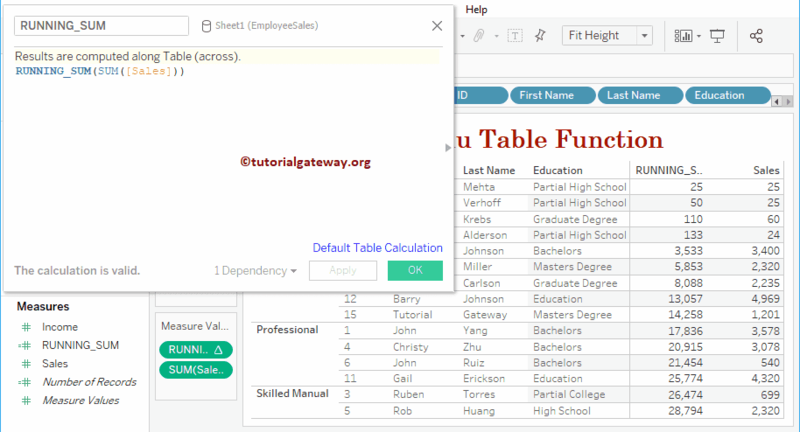 Below statement will find the sample covariance between total cost and sales amount from previous three rows to current row. Let me add this WINDOW_COVARP field to Measures shelf. 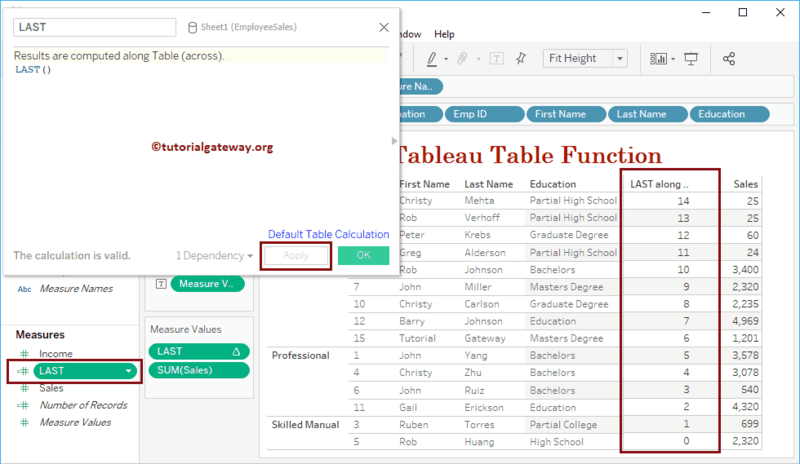 Below statement will find the population covariance between total cost and sales amount from previous two rows to current row.